U.S. Wheat Associates (USW) is the industry’s market development organization working in more than 100 countries. Its mission is to “develop, maintain, and expand international markets to enhance the profitability of U.S. wheat producers and their customers.” The activities of USW are made possible by producer checkoff dollars managed by 19 state wheat commissions and through cost-share funding provided by USDA’s Foreign Agricultural Service. For more information, visit www.uswheat.org or contact your state wheat commission. Original articles from Wheat Letter may be reprinted without permission; source attribution is requested. Click hereto subscribe or unsubscribe to Wheat Letter. What a difference two months make. As of Dec. 1, 2012, export sales of soft red winter (SRW) wheat lagged behind the 2011/12 pace by 9 percent. On Dec. 11, the U.S. Department of Agriculture (USDA) projected total 2012/13 SRW exports would reach 3.95 million metric tons (MMT), 18 percent lower than last year’s mark. But in just 60 days, SRW wheat sales have soared and indications are the accelerated pace could continue for at least the next few months. The catalyst for the change was SRW prices falling below the competition for the first time in six months. Wheat buyers noticed and sales of 1.27 million metric tons (MMT) since December put 2012/13 SRW sales to date at 3.06 MMT, notably 27 percent above last year’s pace. Egypt has been the most aggressive customer, accounting for almost half the December and January sales. On Monday, Egypt’s General Authority for Supply Commodities (GASC) announced it had purchased an additional 60,000 MT of SRW for March delivery. Bids on this GASC tender for U.S. SRW ranged from $307 to $324/MT free on board (FOB). The closest competing offer was for French wheat at $355/MT. That large price spread suggests SRW has competitive staying power. In its January World Agricultural Supply and Demand Estimates (WASDE), USDA increased its projected SRW exports by 400,000 MT to 4.35 MMT, just 3 percent lower than 2011/12 and 1 percent greater than the 5-year average. The February WASDE will be released tomorrow, Feb. 8, and U.S. Wheat Associates (USW) anticipates USDA will reflect the current sales pace by increasing the estimate again. Despite surging demand, SRW prices remain relatively low. Optimism surrounding the 2013 harvest is also encouraging the sale of old crop stocks in order to make room for the new crop. SRW basis levels have remained steady or weakened in the past few weeks, allowing FOB prices to fall with the futures market and fuel sales. Traders are confident they will be able to refill the supply with new crop. USDA’s winter wheat seeding estimate released Jan. 11 certainly supports that sentiment. USDA said farmers seeded 9.42 million acres (3.81 million hectares) of SRW, up 16 percent from last year because of higher prices and poor spring crops in parts of the Midwest. That includes a record 960,000 acres in North Carolina and an estimated 27 percent increase to 1 million acres in Missouri. Ohio’s seeded area is up 24 percent to 620,000 acres and Arkansas farmers seeded 20 percent more, up to 660,000 acres. Growing conditions in SRW growing regions that have been much better than in hard wheat growing areas are strengthening the potential for a large 2012/13 SRW crop. The positive crop outlook could help maintain the relatively low SRW prices that have spurred sales in the last two months. Current SRW supplies are more than sufficient to meet the additional demand and sustain the increased sales pace. USDA currently projects SRW carry out stocks at 4.58 MMT, 2 percent greater than the 5-year average and 35 percent greater than the 10-year average, providing a comfortable cushion for additional exports. With independent bakeries, retail bakery franchises and fresh-baked sections in supermarkets opening in almost every country in Asia, the demand for frozen dough products keeps rising. And to consistently produce the best products possible, these bakeries and the flour mills supplying them can call on USW Singapore-based Bakery Consultant Roy Chung. Last year, Chung was the principle instructor at three baking technology courses in cooperation with the UFM Baking & Cooking School in Bangkok, Thailand. These courses included a frozen dough technology course for 23 participants from six Asian countries conducted in cooperation with the Lesaffre Group, the world’s largest yeast producer. The course covered the basics of ingredients, formulations related to frozen products, processing, thawing and baking methods for frozen bakery products ranging from steamed products to pastries, cookies, cakes and breads. “We invest quite a lot of time preparing for these courses in part because the technology is constantly changing,” Chung said. He noted, for example, that there have been new developments in improvers needed for partial-baked, pre-proofed and freezer-to-oven products. Before the course, Chung had to conduct bake tests to evaluate the flour, special frozen yeast and improvers met commercial quality. He also worked with consultants from Lesaffre to revise the curriculum and demonstrate the improvements in the new materials. The revised curriculum included frozen cake production and new frozen cookie dough formulations. Chung conducted lecture sessions for specific products each morning followed by hands-on workshop sessions in the afternoons during the 10-day course. Frozen doughs produced in the workshops were blast frozen and stored for baking on subsequent days. Providing opportunities for education and technical assistance, including short courses in close cooperation with educational partners in the United States, is a customer service priority for USW. Just this month, USW helped arrange a frozen dough technology course for Chinese bakers and is sponsoring a whole wheat baking short course at the Wheat Marketing Center in Portland, OR. U.S. wheat producers are justifiably proud that their crop has long been the largest single commodity donated to those in need around the world. Now a recent study has shown that monetization (the sale of donated commodities like U.S. wheat in a recipient country to use the proceeds to fund important development projects) provides benefits that exceed the funded development projects. The study, conducted by Informa Economics on behalf of the Alliance for Global Food Security, examined five different monetization projects, two of which included the monetization of wheat donations. One of those projects was a consortium led by World Vision that monetized 49,000 MT of U.S. HRW in 2010/11 to fund development projects in Mozambique under the Food for Peace program. This was part of a larger plan to monetize 142,000 MT of U.S. wheat over five years. The funds generated will serve a wide range of agricultural development and other food security projects reaching 200,000 farmer households and 375,000 young children and caretakers. Informa found that World Vision and its partners received a fair market price for the HRW, with no disruption in local cereal production or the commercial wheat import market. The study also found this program encouraged local market development because monetization sales offered more favorable payment terms compared to commercial commodity purchases. It addressed credit and hard currency constraints and thereby increased the number of market participants that could import wheat. Consumers also benefitted because the high quality of the wheat increased local flour quality that otherwise may not have been available. It also improved food availability to poor consumers through the increase in smaller market participants without disrupting the local flour market and retail prices. Informa also noted U.S. wheat monetization in Mozambique helped fill a supply gap during the Russian wheat export ban, thus increasing local food security. The U.S. wheat industry’s food air policy focuses on making a contribution to global food security. The producers, through its Food Aid Working Group, are committed to global food assistance and encourage programs that include the full range of options to help countries attain lasting and sustainable food security. Visit the Food Aid section of the USW website to read more. The USW Board of Directors elected Brian O’Toole of Crystal, ND, to serve as Secretary-Treasurer for 2013/14 at its meeting in Washington, DC, Tuesday, Jan. 29, 2013. The board elected O’Toole in a slate including Chairman Darrel Davis of Ipswich, SD, who will become Past Chairman, Vice Chairman Dan Hughes of Venango, NE, who will become Chairman and Secretary-Treasurer Roy Motter of Brawley, CA, who will become Vice Chairman. The new USW officers officially begin their one-year terms at USW’s annual meeting, June 29, 2013, in Rapid City, SD. O’Toole began his farming career after attending the State School of Science in Wahpeton, ND. He and his cousin Tom O’Toole operate O’Toole Farms where they produce hard red spring (HRS) and hard red winter (HRW) milling and seed wheat, dry beans, soybeans, corn and sugar beets. In 1996, O’Toole took over a seed cleaning and conditioning business started by his father Richard O’Toole. Based on his experience on a USW Board Team trip to visit customers (Asian Trip Offers Personal Look at USW Work), O’Toole will be expanding an already active participation. O’Toole is an agricultural and community leader. He serves on the North Dakota Wheat Commission, on the board of the Wheat Marketing Center and is Chairman of SBARE Wheat Granting Committee. He is also past president of the North Dakota Crop Improvement and Seed Association and past president of Crystal Farmers Elevator Co-op. O’Toole has received the Young Outstanding Farmer Award, Master Farmer Award and Friends of 4-H Award. Additionally, he and his wife, Sara, were Pembina County NDSU Harvest Bowl Honorees. They have four grown children, two of whom have returned to farming. USW has hired Laura Evaenes as Fiscal Officer and Maybelis Fernandez as Program Coordinator. As USW’s Fiscal Officer, Evaenes is responsible for consolidating all foreign office expenditures and liaison with USW foreign offices and the USDA’s Foreign Agricultural Service on expenditure reporting, account analysis and internal auditing. Evaenes is originally from Montreal, Canada, but attended high school and college in Maryland. She graduated from the University of Maryland University College, Adelphi, with a bachelor’s degree in business administration. She most recently worked for a year with Obama for America in Chicago, IL, as a budget and event analyst, working on many aspects of the 2012 presidential campaign. Previously, she was an advisory financial associate for Price Waterhouse Coopers in McLean, VA, where she worked on USAID and World Bank investment projects in Iraq and Afghanistan. Evaenes spent three months in Iraq as part of this assignment. Prior to this, she was a senior financial analyst for Ferris Baker Watts in Silver Spring, MD. Fernandez has 18 years of experience as a travel consultant and, as Program Coordinator, will provide overseas travel arrangements for USW staff and officers, consultants and others. Longtime associate Fleur Noeth has decided to retire later in 2013 and Fernandez will take her place. For the past three years, Fernandez has worked for a contractor providing help desk support for corporate users, including USW, booking government-paid travel through an online system. Fernandez, who is fluent in Spanish, lived in El Salvador until her sixth-grade year when her family moved to Virginia. Open Outcry Trading at KCBT to End. CME Group plans to close the trading pits of the Kansas City Board of Trade (KCBT) in June as part of its 2012 acquisition of the regional grain market. Open-outcry trade in KCBT’s HRW futures contracts will shift to CME’s Chicago-based trading floor as of July 1. The move requires regulatory approval. CME said the change “will accelerate efficiencies and trading opportunities for customers trading both the HRW and SRW varieties.” Read more at http://bit.ly/UXE7zU. Dry for HRW in Colorado. If it gets much drier, Colorado farmer Jerry Cooksey is concerned this year’s crop will be badly damaged. “Last year we had about 50 percent of normal rainfall,” Cooksey said. When combined with the lack of significant snow fall this winter, it has longtime farmers very concerned. Read and see more at http://on9news.tv/14AvLky. Try Managing HRW Production Risk This Year. Oklahoma State University Economist Kim Anderson discusses the challenging risk management considerations for wheat farmers in the southern U.S. plains in a recent article in Farm Press Publications. Worst case, he says, is farmers get “boxed-in” with wheat production that is less than average so that little or no crop insurance can be collected, but with production and price not sufficient enough to cover costs. Read more at http://bit.ly/14SvZ7R. Condolences to Dr. David Shelton, Executive Director, Wheat Marketing Center, on the recent death of his mother. Follow USW Online. Check out our page atwww.facebook.com/uswheatfor the latest updates, photos and discussions of what is going on in the world of wheat. Also, find breaking news on Twitter at www.twitter.com/uswheatassoc, additional photos at www.flickr.com/photos/uswheat, plus video stories at http://www.youtube.com/uswheatassociates. CASPER, Wyo. 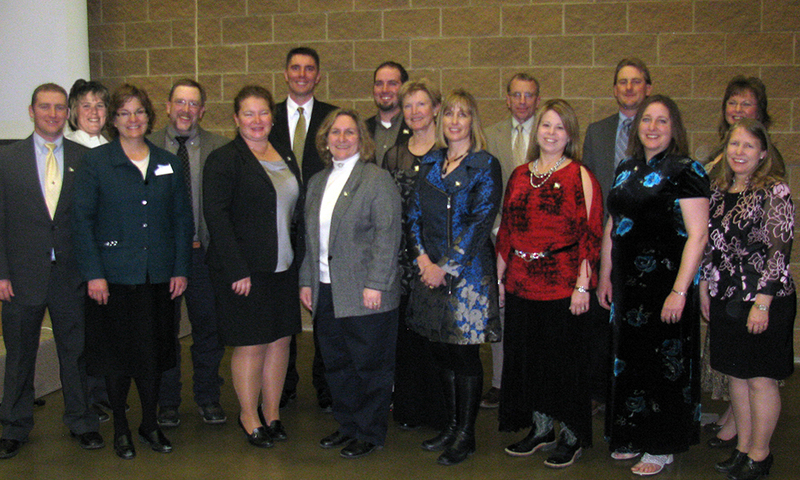 –Fourteen Wyoming producers and agribusiness men and women from around the state graduated from the Wyoming Leadership Education and Development (L.E.A.D.) program’s Class 12 at a ceremony in Saratoga, Wyo., in January. The 14-month training program, sponsored in part by the Wyoming Business Council’s Agribusiness Division, began in November 2011. Throughout the program, fellows participate in educational seminars in an effort to enhance their leadership skills and understanding of all aspects of agriculture and policy making. Eight seminars were held in Wyoming, one in Washington, D.C., and an international study seminar was held in Ukraine. · Ashlea Bassett, of Buffalo, is a service specialist with Sheridan College in Johnson County and a sales associate for Chase Brothers Properties. Bassett has been involved in production agriculture her entire life, including working on her family’s ranch. · Barry “Slim” Cook, of Cody, owns Cook Land and Livestock Brokerage in Park County. In addition to being self-employed in the cattle brokerage and real estate business, Cook is an active member of the Cody Volunteer Fire Department. · Deanna Crofts, of Riverton, is a case manager for the Wyoming Department of Workforce Services. She and her husband also operate a cow/calf operation in Fremont County. Crofts was named Fremont County Ag Woman of the Year in 2011 by the Riverton Chamber of Commerce. · Juliet Daniels, of Cheyenne, is a community development educator with the University of Wyoming Extension, where she works with local governments and nonprofits to increase their capacity to address community issues. · Sherri Foust, of Worland, is the county executive director for the United States Department of Agriculture Farm Service Agency. Foust grew up on her family’s farm in Oklahoma raising grass hay, oats and beef cattle; she continued this tradition for the next 20 years raising cattle of her own. · Brendon Grant, of Glenrock, is a ranch hand and working partner on his family’s ranch, Grant Ranch, in Converse County. As a lifelong rancher, Grant has worked in agriculture in a variety of capacities including overseeing 400 head of Black Angus. · J.W. Hendry, of Lysite, along with his wife, brother, and parents owns and operates Clear Creek Cattle Company in Natrona County. The ranch consists of 2,700 head of Black Angus cattle and more than 500 acres of grass hay. He serves on the board of directors for the Wyoming Stock Growers Association. · Alex Malcolm, of Kinnear, is a 4-H educator with the University of Wyoming Extension providing programming for livestock producers and 4-H youth. Malcolm is a member of the Wyoming and National Association of Extension 4-H Agents. · Mary McAleenan, of Kinnear, is an ag producer operating a 275-acre farm and ranch in Fremont County for hay and alfalfa, as well as a 10-lamb herd for wool production. The wool from her operation is woven into rugs and throws which she markets at craft shows. · Eámon O’Toole, of Savery, is a fifth generation owner/manager on his family’s ranch, the Ladder Livestock Company in southcentral Carbon County. O’Toole is developing an AI program to improve his family’s cow/calf operation by changing the herd into a Black Baldy program. He also helps with the family sheep operation when needed. · Scott Priebe, of Riverton, along with his wife is the owner and operator of Wyoming Ag Marketing, LLC. He grew up farming and ranching on his family’s operation in Indiana and purchased his own farm in the late 2000s. He received an honorary membership degree from the Shoshone FFA chapter in 2011 for coaching the state’s youth FFA winning marketing team. · Cheri Steinmetz, of Lingle, is a self-employed insurance agent, farmer and livestock producer for Rawhide Quarter Horses and Cattle and Ameritas Financial Services. She is involved in her family’s farm near Lingle where they raise corn, hay, cattle and Quarter horses. · Jenny Walker, of Lusk, is a ranch hand for DeGering Livestock Inc., in Niobrara County where she is working with her uncle and grandfather on their cow/calf operation. She’s also involved with her parents’ operation in South Dakota. · Brenda Younkin, of Jackson, is the director of the Conservation Research Center for the Teton Science Schools, Inc. Her position includes consulting on public lands grazing and monitoring, as well as coordination of research programs. Recruitment for Class 13, which will start in the fall, is underway. For more information on the program, contact Cindy Garretson-Weibel at cindy.weibel@wyo.gov or 307.777.6589. Wyoming L.E.A.D. (http://www.wylead.org/) was established in 1984 with a grant from the W.K. Kellogg Foundation to establish a rural leadership program. L.E.A.D. is sponsored by the Wyoming Business Council’s Agribusiness Division and the Wyoming Agricultural Leadership Council (WALC). L.E.A.D. Class 12 participants include: Back Row (L-R) Eamon O’Toole of Savery; Jenny Walker of Lusk; Alex Malcolm of Kinnear; Scott Priebe of Riverton; Brendon Grant of Glenrock; Mary McAleenan of Kinnear; Slim Cook of Cody; J.W. Hendry of Lysite; Sherri Foust of Worland. Front Row (L-R) Kim Porter, program coordinator from Cheyenne; Brenda Younkin of Jackson; Deanna Crofts of Riverton; Cheri Steinmetz of Lingle; Ashlea Bassett of Buffalo; Juliet Daniels of Cheyenne; and Cindy Garretson-Weibel, program director from Cheyenne. Hi Patrick,Independent filmmaker, Conrad Weaver of ConjoStudios, LLC announces the Great American Wheat Harvest (GAWH) documentary film’s 2013 production launch beginning with footage he recently shot at the John Deere Harvester Works Gold Key Factory Tour in Moline, Ill.
For more information, visit the greatamericanwheatharvest.com website. To schedule interviews, speaking engagements or inquire about sponsorship opportunities/benefits contact me, Jody L. Lamp at (406) 698-9675 or by email at jody@greatamericanwheatharvest.com. SAVE THE DATE: Upcoming 2013 events for the Great American Wheat Harvest include:Ag Connect Expo & Summit, and U.S. Custom Harvesters Inc., Annual Convention, both in Kansas City, Jan. 29-31; and National Ag Day, March 18-19 in Washington D.C.
For more information about sponsorship packages, media interviews, speaking appearances of the filmmaker and questions, contact Jody L. Lamp, GAWH National Executive Co-Coordinator, call (406) 698-9675 or by email at jody@greatamericanwheatharvest.com. The 2013 Pennsylvania Farm Show is the largest indoor agricultural event in the nation, featuring nearly 6,000 animals, 10,000 competitive exhibits and 300 commercial exhibitors. The show runs Jan. 5-12 at the Pennsylvania Farm Show Complex and Expo Center in Harrisburg. Admission is free and parking is $10. Visit www.farmshow.state.pa.us for details. The 2013 Pennsylvania Farm Show is the largest indoor agricultural event in the nation, featuring nearly 6,000 animals, 10,000 competitive exhibits and 300 commercial exhibitors. The show runs Jan. 5-12 at the Pennsylvania Farm Show Complex and Expo Center in Harrisburg. Admission is free and parking is $10. Visit www.farmshow.state.pa.usfor details.